I awoke very early on Sunday. Well it was early for me being around 5am or so. I chilled in my room trying to relax as well as determine what my game plan for the day. I eventually went to the club room for breakfast and returned to my room to pack a daypack and then I was off. The drive took about two hours and was rather enjoyable as I journeyed around the eastern and southern areas of the island. 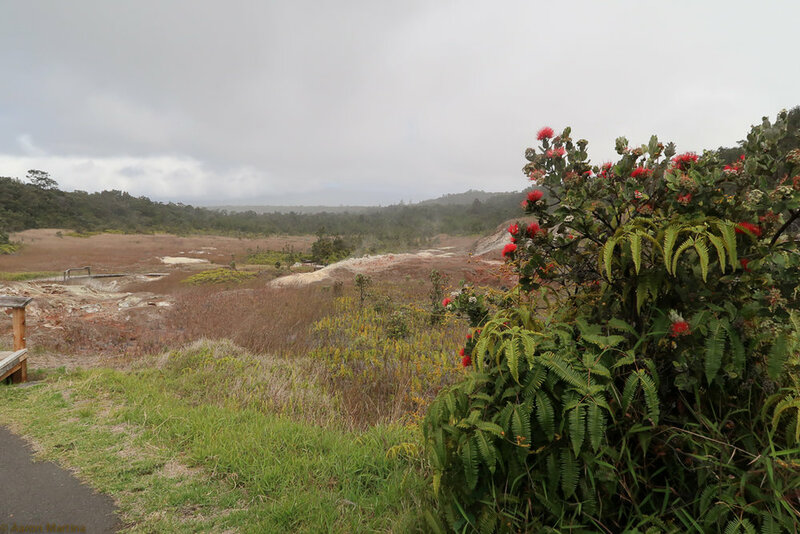 I entered the Hawai'i Volcanoes National Park. I decided to purchase an annual pass to all of the National Parks as I feel that I'll probably visit some other ones during the year. Plus I feel good supporting that organization. I ventured to the Kilauea Visitor Center to use the restroom and figure out my next where to go next. I decided to hike along the trail from the visitor center to the Jaggar Museum and observatory. I grabbed my pack and started to walk at which point the temperature shifted to be in the 60s and it started to mist. About a mile into the hike the mist turned into a downpour but luckily I had my raincoat at the ready. 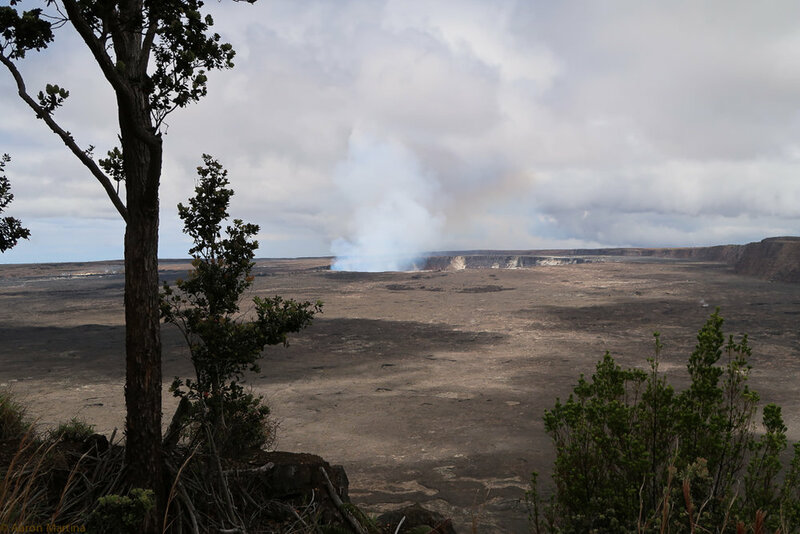 That is when I arrived at the steam vents and the sulphur banks (Ha‘akulamanu). I took a few pictures but the rain was making me worry about my camera so I pocketed it and kept hiking. I eventually made it to the Jaggar Museum and Overlook. I took a couple of pictures including a selfie (that I did not include below) and did a cursory tour of the museum. I utilized the restroom and then struck out back down the path the that had taken me to the overlook. The journey back seemed quicker but also much hotter and I started to get hungry. About halfway back I decided that I was going to eat at whatever eateries were open near the visitor center. That lead me to the Volcano House and the bar at Uncle George's Lounge. I had a lot of water and some overpriced food but it was good and the bartender was friendly. Full and satisfied I ventured back to the jeep and decided that I would drive down the Chain of Craters road and attempt to view the lava flowing into the ocean. 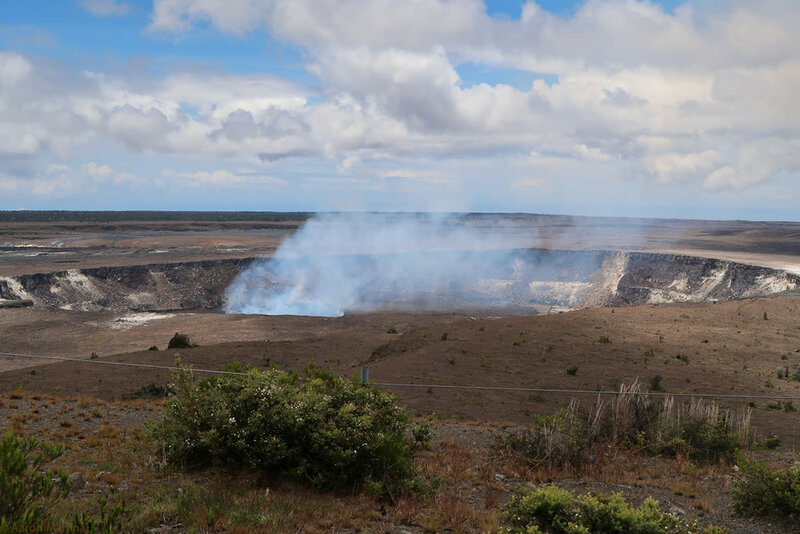 The drive down was nice and scenic as I passed through tropical forests and I made small stops at a few of the older craters along the road and even stopped at an overlook that showcased some of the older lava flows and their journeys into the ocean (one of the pictures below). When I finally came to the end of the road I parked and prepped myself for the hike to see the lava flow into the ocean. The Day Hike brochure stated that the hike would be about 1 1/4 miles round trip so I figured even in my tired of walking state I could manage such as short hike. As I approached the trail head I noticed a bunch of warnings about requiring a good amount of water and other admonishments which I thought were a bit odd for such a short hike. That's when I noticed the sign that stated that the hike was now a 10 mile round trip. My heart sank. I definitely didn't have the recommended amount of water nor did I have the stamina or will to trek the 10 miles without shade. I hiked in about a 1/4 of a mile in order to take a few pictures and then I called it a day as far as hiking. The highway to the volcano. I returned to my jeep and made the journey back past the visitors center and exited the park. I had plans to meet up with some of my fellow travelers but those plans feel through. I made a snap decision to drive to Hilo and at least visit, even if it was in passing, the other major town on the Big Island. It was less than 30 miles away so I figured "what the hell". It was a little bit different than Kona and had more urban feel to it. I should have spent more time there but it was starting to get late. I had read in a guide book that seeing the sunset from Mauna Kea was amazing so I made my way to Mauna Kea as I should have enough time to get there right before the sunset. It took about an hour or so to get to the Mauna Kea access road and then the weather shifted to a very heavy fog. The drive up on the windy and foggy road was a bit hair-raising but I broke through the fog and the skies were clear. My progress to the summit was halted at the Onizuka Center for International Astronomy Visitor Information Station as they weren't allowing any traffic to proceed to the summit. I got out of my jeep in shorts and flip-flops and realized that the temperature had dropped significantly at my new altitude of 9200 ft. I visited the information station and then walked across the street and up a hill, very slowly due to being tired and breathing the thin air, and experienced the sun set. Here are some photos of the sun set. I stayed until it got dark in order to look at the stars. The other visitors to this site were horrible with their night vision etiquette (flashing their flashlights and cellphone lights in all directions and therefore destroying my night vision) and frankly I was tired, hungry, and irritable. I decided to leave and start my drive back to my resort after such a long day. The drive back was rather uneventful but I was hoping to come across some open restaurant so that I could correct my mounting hunger. That didn't come to pass as all of the restaurants that I drove by were closed for the night. Feeling rather defeated I ambled into my hotel and then I found out that the hotel restaurant/bar was still open. The restaurant portion wasn't allowing any more tables to be seated but I saddled up to the bar, Rays on the Bay, and ordered a burger and fries. By this point my hunger had subsided a little bit but I knew I needed to eat something. After consuming most of my meal I shuffled back to my room and passed out.